An electronics company has been found guilty of union busting by the Industrial Court. Court chairman Datuk Mary Shakila G. Azariah said Renesas Semiconductor KL Sdn Bhd had violated the Industrial Relations Act by its actions against members of the Electro­nics Industry Employees Union Western Region Peninsular Malaysia in its employ. She said employers were lawfully bound to respect a worker’s right to engage in unionism and also they can participate in the lawful activities of a union. She added that employers were also ethically and morally constrained from interfering with the affairs of a trade union and the right of workers to organise, discriminate, restrain, or coerce against any worker because of legitimate trade union activities and abuse authority in any form. Mary Shakila said this in the complaint of union busting brought by the union against Renesas for breaching Sections 4(1), 4(3), and 5(1)(d)(i) and (ii) of the Act. The western region union was registered on Dec 1, 2009, seven months after the Government approved the unionisation of the workers in the electronics industry into four regions. Previously, there were only in-house unions in the electronics sector. In her 49-page award dated March 8, Mary Shakila said a Renesas employee, Wan Noorulazhar Mohd Hanafiah, was elected as pro-tem president of the union but he was told by the plant director that he “was not to promote the establishment of a national/regional wide union for the electronics industry” as the company would be forming an in-house union. The union submitted a claim for recognition from Renesas on Jan 18, 2010 but the company refused to grant it. A month later, the company organised a seminar on the setting up of an in-house union which was attended by members of the Joint Consultative Committee (JCC) in the company at Cyberview Resort & Spa. Mary Shakila noted that the timing of the seminar left “a lot to be said” as to the motives of Renesas. Wan Noorulazhar alleged he was offered the role of president in the proposed in-house union, which he declined, resulting in him being made to perform tasks below his job grade and being monitored by the Human Resources Department via CCTV. He was later dismissed in 2011 after a domestic inquiry found him guilty of misconduct for allegedly maligning Renesas Semiconductor publicly on his Facebook page. Wan Noorulazhar is challenging his dismissal in the Industrial Court. While Mary Shakila refrained from passing comment on his case, she noted that his termination was “manifestly a union-busting tactic”. Electronic Union win in 'Union Busting' Case against Renesas Semiconductor? HRD Wan Noorulazhar? victims - finally, he was allegedly 'wrongfully dismissed' on or about 26/8/2011. of the Union dated 8/3/2016. The award is as found below. or 'pay-scale' they should be, if not for these 'union busting' actions of the Company? Will those who have been wrongfully dismissed, now be immediately reinstated? thousand ringgit or to both' (see section 60). If so, it is grossly UNJUST. Who pays for the lawyers? Who pays for the cost and effort expended by the Union? 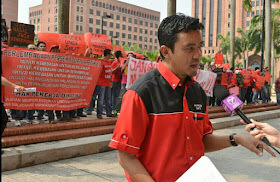 wages for a Minimum Waged Worker in Malaysia) -where is the JUSTICE? 1 - Certainly a more Deterrent Fine? now be in, if not for these 'union busting' activities. that would be just, would you not say? in a different court, and this is odd...and not just. KL Sdn. Bhd. (hereinafter referred to as “the Company”). Semiconductor KL Sdn. Bhd. (hereinafter referred to as “theCompany”). was elected as its pro-tem President. Admin Department to facilitate the establishment of the in-house union. Company on 18 January 2010.
grant recognition to the Union. him to encourage other employees to join the in-house union. even by the installation of CCTV. reference or final date determined by this Honorable Court. 4(2), 4(3) and 5(1)(d)(i) and (ii) of the Industrial Relations Act 1967.
acquired the necessary qualification for promotion as a chargeman. the Company publicly online through his facebook page. Admin Department for requirements on establishing an Union. that Mohd. Nazri declined the said offer. located in the States of Selangor, Wilayah Persekutuan and Perak. a claim for recognition on 8 January 2010 to the Company. an in-house union in the Company. the HR Department even by the installation of CCTV. that Wan Noorulazhar declined the offer. but not to the active shop stewards of the Union and 1 Exco Member. He said Wan Noorulazhar was paid 6% out of a maximum of 12%. inquiry found him guilty of misconduct that was without basis. appeal was dismissed by the Court of Appeal as well. with the Minister of Human Resources order recognising the Union. Wan Noorulazhar and other employees of the Company. 11 February 2009 and that its Secretary–General was UW.1. him to work with Zulkifly in the setting up of the in-house union. Loh met Mohd. Nazri and during this meeting he rejected Loh's offer. bt. Md. Ful and Roziah bt. to the officer at JPP Putrajaya. if he was to be dismissed. participate in the Union and to become a member of the in-house union. by the Company when special incentive payments were paid out. dismissed at anytime and therefore asked him to hand over his work. It was his testimony that he was eventually dismissed on 26 August 2011.
ago and that his handphone no longer functions. the disadvantages of joining the Union. its claim for recognition so that the in-house union could be set up. Company's orders that he be monitored. union that is sponsored by the Company. Company with their claim for recognition on 6 September 2011.
members were save for Siti Jumiah. made another claim for recognition on 6 September 2011.
up by Zakaria bin Deraman. employees to go against the Company. Regional Union for electronics Workmen had been established. were members of the Pro-tem Committee of the in-house union. Honourable Minister directed the Company to accord recognition to it. Wan Noorulazhar or meeting him in 2010 and 2011.
stating that the Union's claim for recognition was defective. to do with whether they were members or active in the Union. He testified that he did not know who the Union's shop stewards were. to him that it was also about formation of an in-house union. he could talk this out with Encik Zulkifly Abdul Rahman. did so he could be given up to 12% as a special incentive. if he followed UW.2 he too would have no future in the Company. that he did not meet UW.2 in February 2011.
and that it was the decision of the Human Resources Department of the Company. that UW.2 was the President of the said regional Union. legitimate Trade Union and workers activities. and/or disciplined by reason of their involvement in Union activities. individuals and a war on truth. As such it is a war without honour. taking of disciplinary action or discriminating against Union members. and to participate in its lawful activities. discharged its burden on a balance of probabilities? on 31 July 2009. These facts are not in dispute. s extent was not rebutted by the Company. e could appoint anyone to be in leadership with him in the in-house union. and to join the in-house union. workmen by the Company. This was denied by the Company. he did not know who the shop stewards were. and his future in the Company are denied by them. tantamount to a clear-cutviolation of section 4(1) by the Company. Company and have risked their jobs to testify against the Company. to this limb of section 4(I). at the Hearing from establishing a Union already in the making. leaves a lot to be said as to the motives of the Company in organising the same. the object of placing it under the control or influence of it. formation of the in-house union in violation of this section. will be dismissed by the Company. 2009 that is since his appointment as President of the said Union. applying for its recognition and participating in its lawful activities. because of legitimate Trade Union activities and abuse authority in any form. submissions in Court. This is the Court's final order. in this Blog. We have tried our best to ensure that there are no errors.